Not that on the calc this looks fine (like, no double lined-up sprites every other frame), that's just an emu glitch. I'm working now on swapping rows. Will post updates here as I go. That's the current sprite sheet. If anyone wants to give making a better set a go (as well as an 80x60 start screen thing), I would much appreciate it! Eager to see this as playable soon! I'm glad you're taking this project on, Merth, even if I'm slightly jealous that I wanted to do it as well and you got to it first. I waited so long to respond because I wanted to debug the interlacing effect you see in the screenshot, and lo and behold, I found the bug and fixed it. When you next take a screenshot, assuming you refresh jsTIfied, you should see it fixed. Did I miss a joke about benryves being a frog as well as a dinosaur? Or is that supposed to be a dinosaur head? I guess since it's DinoPuzzle, that makes sense. Are you going to keep the pink background in the final version, merth? That's the only thing about that screenshot that jars me right now; everything else looks superb and true to the original as well. I think that's much nicer. Oh yeah, it's definitely a lot nicer on the dark background, although I'm still not totally sold on the pink. Unless you object, I might try a few random color combinations tomorrow and see if any of them appeal to me more. Of course, if everyone thinks the pink + lime + burgundy looks fine, I defer to consensus. Have my cake and eat it too? 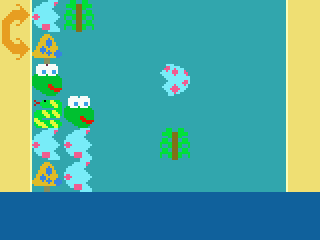 In one of your earlier screenshots, a snake and dino both flashed pink partway through falling. Was that a game-mechanic or just a graphical hiccup? I haven't played DinoPuzzle in a while so my memory is foggy on the specifics of the gameplay. It wouldn't hurt to study these against a backdrop other than Cemetech Silver. I like Weregoose's layout, except that the middle blue is just the wrong shade/tint for the everything else to stand out correctly. The sprites + yellow bits + dark blue bottom are a lovely combo though. At first my thought was "eugh", but I'm not really a huge fan of yellow. The more I look at it the more I like it. I kind of like a darker look in general, but I think for a game like this a brighter look makes more sense. Was that a game-mechanic or just a graphical hiccup? That's a very common jsTIfied glitch. WOW! This is looking great, and i love the speed . The rest of what I work on tonight is going to be engine/backend stuff, so I probably won't post another screen shot. That's great progress! What sort of engine/backend stuff are you going to be working on? When will egg-creating or whatever that particular mechanic appear? I'm very anxious to start beta-testing this game. Just kind of rearranging/cleaning up code, and switching the xLib's random stuff. I've also got a bunch of code written to do swapping, but something's wrong with it so I have to figure that out. © Copyright 2000-2019 Cemetech & Christopher Mitchell :: Page Execution Time: 0.131362 seconds.